Providing the best personal service in quality Martial Arts instruction without sacrificing integrity. Here you will find a little information about our martial arts programs, our facility, the instructors at our school, different events held at our school, and more. Check the bottom of many of the pages for comments and insight from our members. Our contact information is at the top of each page and it's also on our "Contact Us" page if you would like more specific information or would like to arrange a visit. For details, check our MEMBERS page. American Karate T-shirt Week is posted on the calendar at the school. Check it out! New Gear Bags in Stock! Board breaking in class $4 fee and completed Behavioral Performance Form required. Black Belt clean up the end of this month. (See school Calendar). Be ready for pizza when done! Welcome to American Karate Academy! 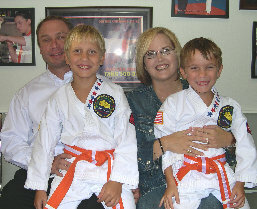 American Karate Academy is independently owned by Darin Morgan with 19 years of martial arts experience in Tang Soo Do and kickboxing with many years of competition on the Open Tournament circuit along with teaching under his instructor and two other schools in the same system for several years. This experience shows in our well run classes where the skills of martial arts are passed to every student at each age and experience level. Before enrolling in any Martial Arts program, you should compare schools. Not simply price or time to reach Black Belt. None of that is integrity based. In comparing schools, what you will find above all else is that American Karate Academy offers quality and integrity. Belts are not acquired simply by writing a check or attending a certain number of classes. It is important to us that you learn quality martial arts at all levels and if you or your child enrolls in our school, you will find that we take that very seriously. This doesn't mean a student must be physically gifted or a great fighter to reach Black Belt, but they must be willing to give their best. As your Instructors, we'll take care of the rest. Because this choice is yours, it is up to you to determine who will be in charge of teaching you or your child martial arts. No matter what school you choose, do the research. All our Instructors are hand selected by Head Instructor Darin Morgan. This means that while all teachers have their own unique teaching style and personality, they all teach the same techniques and skills. This assures greater continuity throughout the classes. When attending classes taught by other instructors, you can be comfortable knowing the material is uniform every day. For more information on our instructors, see our Instructors section of the website. Our classes at American Karate Academy are designed so that each student can succeed at his or her own pace. We believe that students learn best when they are in classes that are appropriate for age and skill level. Our classes are divided into sections depending on the student's age and belt rank. This ensures that the students in one class can learn as a team instead of feeling left behind or being held back. For more information on our classes, see our Classes section of the website. Please feel free to browse our website where you will find more detailed information about the many programs that we offer. Call today to find out about our special introductory offer! Karate as well as academics was an important factor in my choosing American Karate Academy. Not only is it a martial arts based program, it is also an academics based program. Mr. Morgan always encourages EVERY child to do well in school academically and behaviorally, "Like a Black Belt Would Do". I really like that part of his program. The students are also rewarded for their academic achievements in his classes. Mr. Morgan not only teaches martial arts to my children, he also teaches them to make good choices and how to prevent confrontations. Sometimes he will sit down and have real heart to heart talks about important subjects such as strangers, safety, bullying etc. That is the kind of program a parent wants to look for when looking at various martial arts schools. Those that teach only how to fight and become a bully are not what you are looking for. I would have to say from personal experience American Karate Academy is just the place to be to learn a strong martial arts background along with the compassion and caring of a true Black Belt. Thank you Mr. Darin for all you do!!! Why I chose American Karate Academy? The main reason and most important reason to me is the instructor, Mr. Darin Morgan. He not only runs a karate school based on martial arts but he really cares about each and every one of his students and what is happening in their lives. The program and school are great at American Karate Academy. The focus is on teaching martial arts, but at your own child's pace. When Mr. Morgan feels your child is ready to take a test for the next belt you know it's really time for your child to move up a belt. Anyone can buy a belt on ebay or hand out belts on a whim, but karate is important to Mr. Morgan and he instills that into each student.